The University of Northampton is pleased to announce that the recipient of this year’s Crick Science Journalism Award is BBC Global Health correspondent, Tulip Mazumdar. The Crick Science Journalism Award is given every year to a journalist who makes an important scientific issue clear and understandable to a general audience. 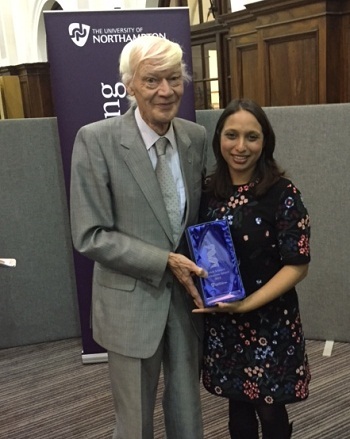 Tulip received her award from Francis Crick’s cousin Brian Dickens, who still lives in Northampton, at a special ceremony last night. The event was hosted by the University of Northampton’s Vice Chancellor Nick Petford and held in the Newton Grand Hall. Tulip was recognised for her reporting on the Ebola outbreak in West Africa earlier this year; a story which continues to be of major concern around the world. Before the awards ceremony, Tulip held a special workshop for BA Multimedia students. She was joined by last year’s winner Tom Clarke, Science Editor of Channel 4 News who was awarded for his work covering global warming. The Crick Science Journalism Award is named in honour of the Nobel-prize winning scientist Francis Crick who was born and raised in Northampton. As a boy he conducted his first scientific experiments here, blowing up bottles of chemicals with electrical charges in his parents’ home. In 1962 he was awarded the Nobel Prize (along with his colleague James Watson, and Maurice Wilkins) for discovering the structure of DNA—one of the great scientific advances of the 20thcentury. He went on to work on the challenge of cracking the genetic code which led ultimately to the mapping of the Human Genome in 2003. He was also a great communicator of science, and early in his career considered becoming a science journalist. The Francis Crick Institute in London, which opened earlier this year, has already become one of the leading biomedical research facilities in Europe. Its work is dedicated to his eclectic interdisciplinary approach.